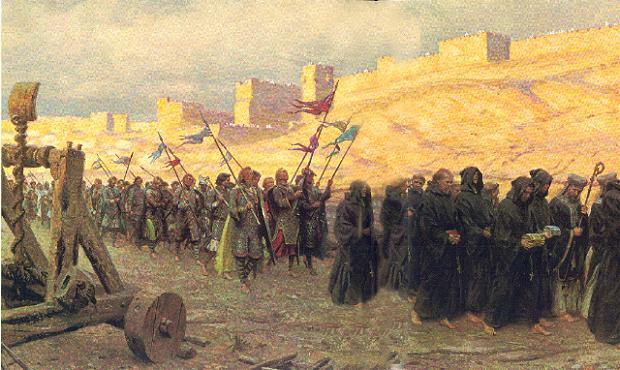 The siege of Jerusalem: procession around the walls. Ten days after their victory the Crusaders employed themselves in restoring the throne of David and Solomon, and in placing upon it a leader who might preserve and maintain a conquest that the Christians had made at the expense of so much blood. The council of the princes being assembled, one of the leaders (history names the count of Flanders) arose in the midst of them, and spoke in these terms: “Brothers and companions; we are met to treat of an affair of the greatest importance; never did we stand in greater need of the counsels of wisdom and the inspirations of heaven. In ordinary times it is desirable that authority be in the hands of the most able; with how much greater reason then ought we to seek for the man most worthy to govern this kingdom, still in a great measure in the power of the barbarians. Already we are told that the Egyptians threaten this city, for which we are about to choose a master. The greater part of the Christian warriors are impatient to return to their country, and to abandon to others the care of defending their conquests. The new people then who are going to inhabit this land will have in their neighborhood no other Christian nations to assist them in their need or console them in their disgraces. Their enemies are near them, their allies beyond the seas. The king we shall give them will be their only support amidst the perils which will surround them. He then who is called upon to govern this country must have all the qualities necessary to maintain his position with glory; he must unite with the bravery natural to the Franks, temperance, good faith, and humanity; for you know by such virtues great principalities are acquired and kept as well as by arms. Let us not forget, brothers and companions, that our object today is not so much to elect a king for Jerusalem, as to bestow upon it a faithful guardian. He whom we shall choose as leader must be as a father to all those who have quitted their country and their families for the service of Jesus Christ and the defense of the holy places. He must make virtue flourish in this land where God himself has given the model of it; he must win the infidels to the Christian religion, accustom them to our manners, and teach them to bless our laws. A fresco depicting the capture of Jerusalem. If you elect one who is not worthy, you will destroy your own work, and will bring ruin on the Christian name in this country. I have no need to recall to your minds the exploits or the labors which have placed us in possession of this territory; I will not remind you of the dearest wishes of our brothers who have remained in the West. What would be their sorrow, what would be ours, if, on our return to Europe, we should hear that the public good had been neglected and betrayed, or religion abolished in these places where we have restored its altars? Many would then not fail to attribute to fortune, and not to virtue, the great things we have done, whilst the evils which this kingdom would undergo would pass in the eyes of men as the fruit of our imprudence. 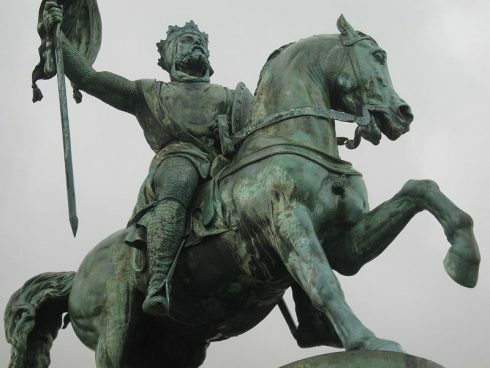 Godfrey of Bouillon being created the Lord of the city. From British Library Manuscript in the Yates Thompson Collection. Scarcely had the count of Flanders ceased speaking, than all the other leaders gave him the warmest praise for his prudence and good feelings. Most of them even thought of offering him the honor he had declined, for he who in such circumstances refuses a crown, always appears to be the most worthy of it; but Robert had expressed himself with frankness and good faith; he longed to return to Europe, and was satisfied with the honor of bearing the title of “the Son of St. George,” which his exploits in the holy war had obtained for him. 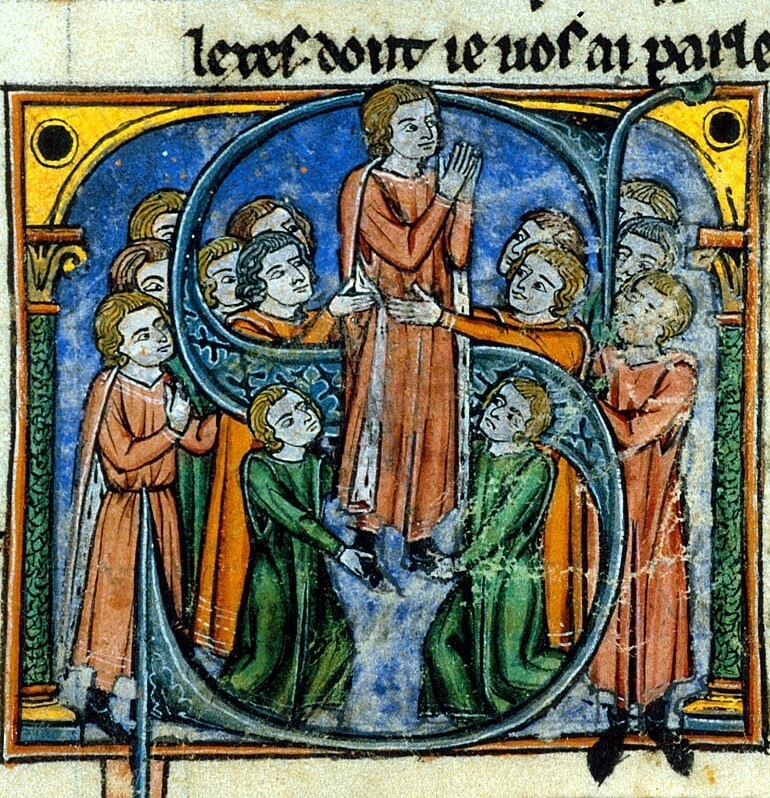 Godfrey of Bouillon chosen as leader by the barons in Jerusalem. Among the leaders who could be called upon to reign over Jerusalem, we must place in the first rank Godfrey, Raymond, the duke of Normandy, and Tancred. The only object of Tancred was glory in arms, and he placed the title of knight far above that of king. 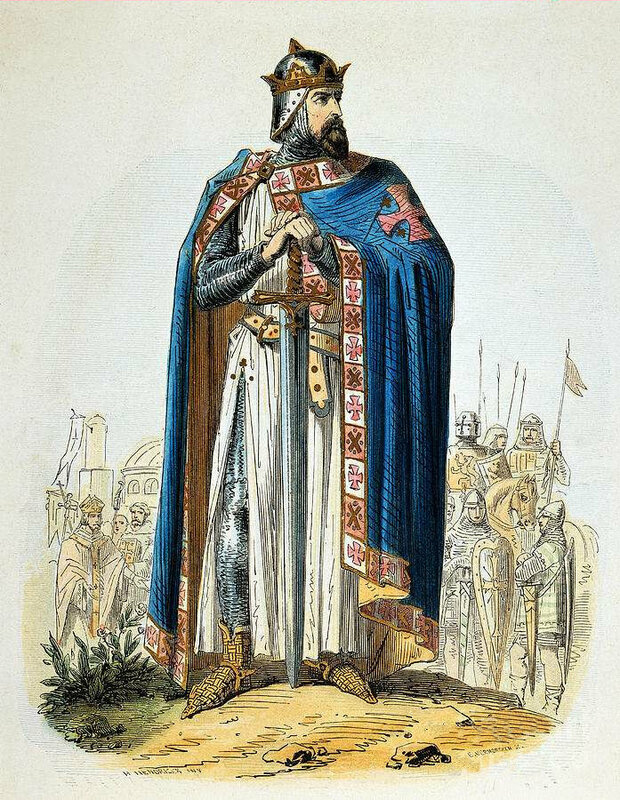 The duke of Normandy, likewise, had evinced more bravery than ambition; after having disdained the kingdom of England, he was not likely to be anxious to gain that of Jerusalem. If we may believe an English historian, he might have obtained the suffrages of his companions, but he refused the throne of David from indolence, which so irritated God against him, says the same author, that nothing afterwards prospered with him during the remainder of his life. The count of Toulouse had taken an oath never to return to Europe, but his companions dreaded his obstinate and ambitious character; and although several authors have said that he refused to ascend the throne on account of his great age, everything leads us to believe that the Christians feared to have him for king. The opinions of the leaders and the army were various and uncertain. 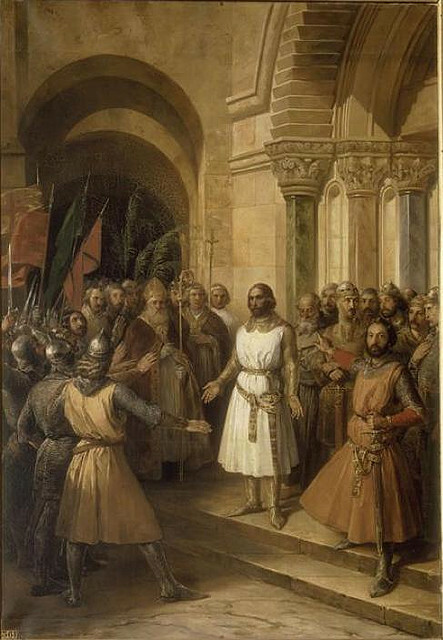 The clergy insisted that a patriarch should be named before they elected a king; the princes were not at all agreed among themselves, and of the body of the Crusaders, some would have wished to choose him whom they had followed through the holy war, whilst others, like the Provençals, who had no attachment for the count of St. Gilles, and were not desirous of remaining in Asia, gave all their efforts to keep the crown of Jerusalem from the prince under whose colors they served. To terminate the debate, it was decided that the choice should be made by a special council of ten of the most highly respected men of the army. Prayers, fasts, and alms were commanded, in order to propitiate Heaven to guide them in the nomination they were about to make. They who were called upon to choose the king swore, in the presence of the whole Christian army, not to listen to any interest or any private affection, but to decree the crown to wisdom and virtue. These electors, whose names history has not preserved, gave the utmost attention to ascertain the opinion of the army upon the merits of each of the leaders. William of Tyre relates that they went so far as even to interrogate the familiar associates and servants of all who had any pretensions to the crown, and that they made them take an oath to reveal all they knew of the manners, characters, and secret propensities of their masters. The servants of Godfrey of Bouillon gave the most striking evidence of his mildness and humanity, but above all his exemplary devotion. To add to this honorable testimony, the exploits of the duke of Lorraine during the holy war were dwelt upon. They remembered that at the siege of Nicaea he had killed the most redoubtable of the Saracens; that he had split from shoulder to haunch a giant on the bridge of Antioch, and that in Asia Minor he had exposed his life to save that of a soldier who was overpowered by a bear. Many other feats of bravery were related of him, which in the minds of the Crusaders placed him above all the other competitors. Click here to download a free desktop wallpaper of Godfrey of Bouillon! Godfrey was the leader decidedly in possession of the suffrages of the majority of the army and the people; and that he might not want anything in the expression of their wishes for his success, revelations were announced that God himself declared in his favor…. At length the electors, after mature deliberations, and an anxious inquiry for all necessary information, proclaimed the name of Godfrey. This nomination caused the most lively joy throughout the Christian army, and was considered as an inspiration of heaven. By the authority given to him, Godfrey became the depositary of the dearest interests of the Crusaders. Every one among them had in some sort confided his own glory to him, by leaving him the care of watching over and guiding their conquests. They conducted him in triumph to the church of the Holy Sepulcher, where he took the oath to respect the laws of honor and justice. He refused the diadem and the insignia of royalty, saying that he would never accept a crown of gold in a city in which the Savior of the world had been crowned with thorns. He contented himself with the modest title of defender and baron of the Holy Sepulcher. Joseph François Michaud, The History of the Crusades of the Crusades, trans. W. Robson (New York, Redfield, 1853), vol. I, 230-5.